Stuff Points: Earn 89 points when you buy this stuff. Transform any outdoor water feature into something more dynamic with this powerful mister. It will float in any body of water and pump out an endless stream of natural mist. A thick cloud will form on the surface and then waft out to other parts of your landscaping. It is a non lighted model for a more natural look, and it comes complete with all weather power transformer and a flotation ring to keep it floating at the right height. Made durable for use in your backyard, but nothing will stop you from placing it inside if you want to. Thanks to the triple head design it puts out three times as much mist with just a single power source. Use in pond setting to enhance the look, or use to increase humidity for plants and wildlife. It does not use chemicals or anything toxic to make the fog, and it does not heat the water as it works. It is completely safe for fish underneath and other critters in the area surrounding it. Although it looks like thick smoke, the mist generated is nothing more than water vapor. Ensure all parts are present. You will need the power transformer, the floating ring and the actual mist generator. Find a power outlet closest to the water and plug in the transformer. The included cord is pretty long, but an extension can be used if it is outdoor rated. For safest set up, wait to connect the transformer to the mist maker. Whenever submerged to the correct depth, this unit will produce mist. 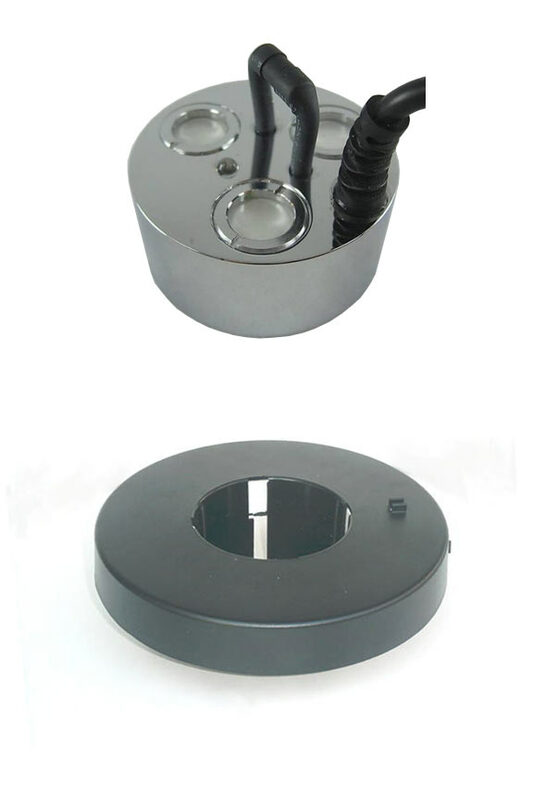 It can be used with or without the ring, but both combined ensure proper water level and easy operation. To combine with the ring, just pop the metal mister into the inner circle. A clip on either side will help to position the cord. Depending upon proximity and placement options, set the mister prior to plugging it in. If needed connect the cords and then place the whole unit where you want it. When floating it will move around, but you can also anchor in place if desired. Once the cords are connected, and the mist maker is under the water, it will begin working immediately. Thick fog will emerge from the unit until you turn it off, or run out of water. A sensor at the top will turn it off when there is not enough water. Use inside or outside. If used indoors be aware of splashing, and compensate accordingly. Create the ultimate look with this high quality unit. Plain old water is great, but when you add another dimension it gets even better. This powerful fogger will enhance any water in your yard to add humidity and produce a cool looking effect. The endless billow of natural mist helps nearby plants, creates hiding places for wildlife, and allows you to enjoy your yard even more. Other units have flashing lights with bright colors, but this one creates a more natural effect. Your coy will not be able to throw dance parties, but they will enjoy their relaxing environment. High quality materials ensure proper function and years of use, and the multiple head design allows for tons of mist with a single power source. Create a dry ice look on the surface of the water with this safe and effective ultrasonic mister. It is incredibly easy to set up, and will provide a unique look that is well worth the cost. Order Yours Today! Floating Ring Included Yes - Complete set with purchase. Call for a lower price if you don't need it. A Powerful Outdoor Mister With 3 Heads - Enhance ponds and other water features by adding natural mist on the surface. This floating fogger is easy to set up, and reliable to operate. We love our new mist maker. It adds a unique dimension to our outdoor water feature. The rolling swirling mist is mesmerizing to watch. Since the garden pond is now and has been frozen solid for months, I used the kitchen sink to test mist maker. It worked quite well enough to freak out my wife when she came home from work. No. It is only available with one cord size option. Commercial Grade Trimmer Head Replacement With Advanced Pivot Design. Store seasonal and recreational tires when not in use. Holds up to 300 lbs.